Furnished with artwork, antiques, and oriental carpets, the elegant Mansion features original fireplaces, a breathtaking grand staircase and enclosed Atrium. The Atrium can accommodate 150 guests seated, and up to 200 guests for cocktails or a seated dinner/event with additional tenting. Set among beautiful landscaped gardens and trails, the picturesque venue is ideal for outdoor garden weddings. Call 410-486-2405 for further details on rates and availability. What does an event venue reservation at Gramercy Mansion include? First-floor public rooms including an elegant foyer, parlor, dining room, living room (dance floor), library and bar. 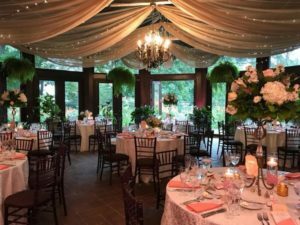 Enclosed garden atrium, landscaped gardens and manicured walking paths behind the Mansion, including a breathtaking lower ceremony garden and shade garden with marble gazebo. Heating and air-conditioning in all first-floor rooms and enclosed Atrium for year-round comfort. Handicap-accessible restrooms, conveniently located on the first floor. Use of our piano in the living room upon request. Atrium lighting featuring a canopy of bistro lights and crystal chandeliers. Two fireplaces (wood and gas) providing a warm and inviting ambiance during cooler months. Commercial kitchen for catering use. Tables and chairs for up to 150 guests. On-site attendant to oversee the venue and assist as needed. We do not provide event coordinator services. Venue rental does not include catering. A caterer from our approved list must be contracted for all events. Located directly across the center circle from Gramercy Mansion, the Carriage House includes three large, ground floor rooms. French doors open into a central courtyard strung with bistro lights with separate kitchen facilities for catering. Parties can be extended to the garden courtyard with fountain, as well as the oval Carriage House Edwardian garden. An ideal location for intimate affairs and rehearsal dinners, this space can accommodate up to 100 guests seated! We offer special reduced rates for rehearsal dinners in the Carriage House if you are hosting your wedding in the Mansion. What does an event venue reservation at the Carriage House include? Three adjoining indoor rooms with hardwood floors, chandeliers and a marble fireplace. The courtyard with center fountain, center circle garden and surrounding landscaped lawns. Heating and air-conditioning indoors for year-round comfort. Courtyard lighting featuring a canopy of bistro lights. An electric fireplace in the Carriage Room, providing a warm and inviting ambiance during cooler months. Tables and chairs for up to 100 guests. For receptions & parties with breathtaking views of the Inner Harbor, consider our event sites in downtown Baltimore at the 1840s Plaza! The fourth floor 1840s Ballroom features sparkling crystal chandeliers, a spacious hardwood dance floor, hand-painted murals of historic Baltimore and a mahogany pub-style bar. (Accommodates 230 seated, 350 standing). The second floor 1840s City Lites features the historic White Tower diner, vignettes of historic city scenes and a large dance floor with DJ booth. (Accommodates 160 seated, 250 standing). Learn more by clicking here or calling (410) 385-1840.